Use these tips for successfully introducing yourself to new clients. When first meeting new clients, you want to give them the impression of professionalism and confidence. This will immediately garner trust, which is the No. 1 most important aspect of a caregiver-client relationship. Pay attention to the cues you're giving off, like body language and tone of voice. Also, be sure to show them your positivity right away. As a caregiver, you'll have to be many things, including calm, empathetic, firm, knowledgeable and organized, to name a few. However, your positivity during stressful, difficult and emotional times is what will get you and your clients through. 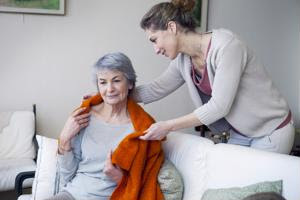 The nature of in-home elder care means that your relationship with your clients is a little more intimate than that of a doctor and his patients. A personal relationship will take some time, but open the door by sharing a little bit about yourself. Talk about your family, likes, dislikes and interests. Don't forget what this meeting is really about. Make sure you come prepared with questions that will set you up for success when caring for your clients. Cover topics like health, lifestyle, allergies, medications and anything else you'll need to know for day-to-day care. Listen intently to the responses to show respect for your clients and their needs.